Optimising and review network strategy, markets, fleet, competitors and utilisation. Airflite expertise. The optimal network strategy and network design needs to consider almost every aspect of the airline operation and environment. Greenstone Aero recognises the complex balancing required to achieve the best mix between market and operational requirements. 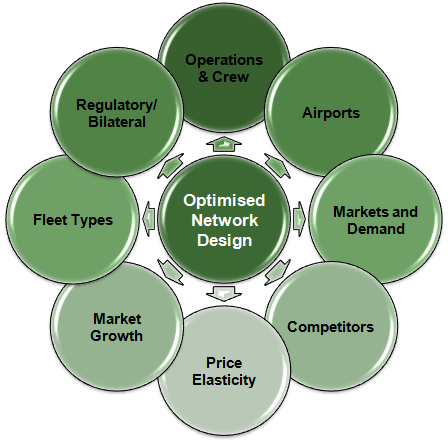 Optimal fleet type requirements, market sizes, competitors, fleet type economics all need to be considered when designing the network. The Greenstone Aero planning models can test many network scenarios, and when utilised with the Greenstone Aero financial model can be tested for profitability. Greenstone is able to develop entirely new network strategies or to review existing network structures.